In Nick Payne’s brainy, open-hearted two-hander Constellations, Jake Gyllenhaal and Ruth Wilson play an English couple – Marianne is a physicist, Roland a beekeeper – who meet at a barbecue, move in together, break up, rediscover each other and get married. It’s the arc of a love affair with a tragic ending, only it takes place, as the program informs us, in “the multiverse,” where, according to Marianne’s research, “at any given moment, several outcomes can co-exist simultaneously . . . [and] every choice, every decision you’ve ever and never made exists in an unimaginably vast ensemble of parallel universes.” So the fleet seventy-minute play (measured in conventional time, that is) consists of a series of short scenes that continually reimagine the scenario. In alternate versions of Roland and Marianne’s opening gambit, they fail to connect because he has a girl friend or is already married and her interest in him ricochets back on her. In alternate versions of their first date, she invites him in but reconsiders and sends him packing, which he understands or resents. The stop-and-start structure recalls David Ives’ comic one-act Sure Thing, an undergraduate directing-class perennial, but the tone is entirely different. The shifts in and out of scenes (and moods) demand breathtaking technical skill, not the least of which is hair-trigger timing. 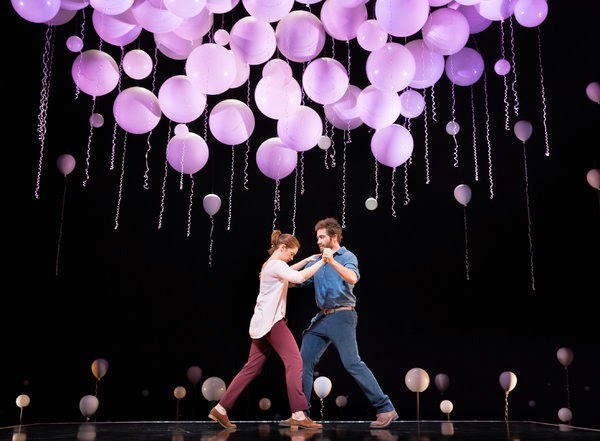 Gyllenhaal and Wilson are so impressive that it took me a while to focus on anything else, aside from Tom Scutt’s exquisite set design – balloons suspended above and around an elevated playing area a little like an unbounded boxing ring – and Lee Curran’s lighting, which gives those balloons a silvery dazzle. (Scutt also furnished the costumes.) For about the first third Constellations feels like it’s all about acting. Gyllenhaal appeared in the last Nick Payne play to make it across the Atlantic, If It Is I Haven’t Found It Yet, also under the expert direction of Michael Longhurst, and once again he manages to be as convincingly British as so many British actors are convincingly American when they perform the reverse trick. He gives a fine performance, and Wilson, the co-star of the Showtime series The Affair, is even better, though perhaps only because she has the more difficult role. It isn’t until Payne clarifies the intimations of impending tragedy that you realize that his play has not only tremendous skill (he has a gift for dialogue) but also depth. At that point Marianne’s investment in time theory links up with the narrative. “The basic laws of physics . . . don’t have a past and a present,” she explains to Roland. “Time is irrelevant at the level of atoms and molecules. It’s symmetrical. We have all the time we’ve always had. You’ll still have all our time . . . There’s not going to be any more or less of it.” In other words, the omnipresence of past, present and future – which reminded me of the idea of time as a river that Kurt Vonnegut expounded in Slaughterhouse-Five, and which other sci-fi writers have weighed in on too – simultaneously gentles the tragedy and, ironically, emphasizes it by throwing it into relief. And the co-existence of distinct paths (“every decision you’ve ever and never made exists in an unimaginably vast ensemble of parallel universes”), the fact that the characters might never have become (or stayed) a couple in the first place, enhances the poignancy of what happens to them when we think of all the paths that might have led them away rather than to each other. In this way and others, Constellations may make you think of Richard Linklater’s Before Sunrise/Sunset/Midnight trilogy, in which the random and the fated are a breath apart.